At CMI, we’ve always taken our mission of advancing the practice of content marketing seriously. And one of the best methods we know of when it comes to sharpening our skills and expanding our vision of what’s possible is to follow the examples set by some of the industry’s best and brightest practitioners. I’m sure you follow the advice of many of the well-known industry pros who graciously share their insights in our blog posts, at Content Marketing World sessions, and throughout our social media forums. But today, I am proud to introduce you to a new batch of experts to keep an eye on: the winners and finalists from this year’s Content Marketing Awards. For the 13th year, the awards program recognizes the remarkable accomplishments of content marketers in categories that span strategy, distribution, design, and editorial. In all, 96 winners were selected this year from a field of over 1,000 submissions. “Game-changing” hardly begins to describe 2016 for Frontline Education. It was a year that brought a massive rebrand for the nearly 20-year-old software company, along with multiple new solutions and personas, a shift from direct mail to a robust digital marketing program, and aggressive growth goals. 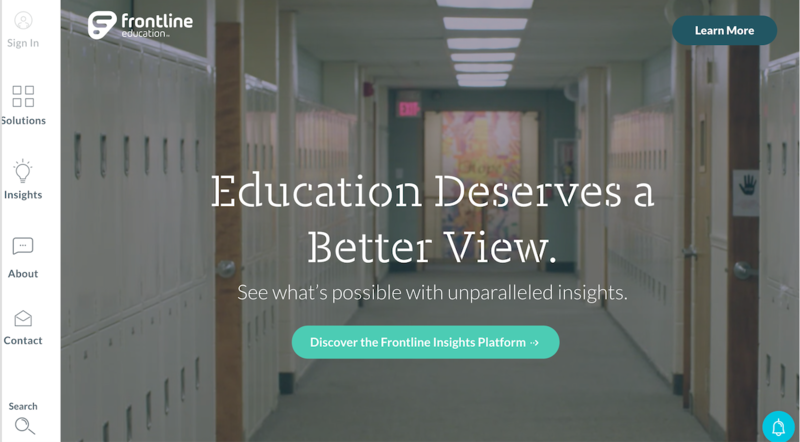 As Frontline crystallized its focus on the K-12 education market, its marketing department was tasked with generating one-third of the company’s sales pipeline. The team tackled this goal by building and documenting a content marketing strategy – including a mission statement, persona profiles, a topic repository, and an editorial calendar – around informing, educating, and inspiring education leaders. To drive relevant topics for the market, the team leveraged customer interviews, internal subject matter experts, and original industry data from a separate content marketing initiative – the Frontline Research & Learning Institute. Marketing exceeded its goals and generated 32% of the company’s new business. Content saw steady engagement, and increased engagement in new market areas. In one area (professional growth) Frontline saw a 195% increase in click-to-open rates. Despite a high volume of marketing emails, the value of the content led to very low (<0.7%) opt-out rates, speaking to the value of the content. Not only does their content receive frequent accolades from company leadership, but prospective clients have emailed to thank Frontline for its content. AARP The Magazine may be targeted to readers over 50, but it certainly hasn’t been relying on your grandmother’s content marketing strategy to achieve the second-highest readership of any print publication or earn it the title of the nation’s largest consumer magazine by base rate (22 million households receive it). AARP credits its focus on topics that directly affect the lives of its readers as a major element of its growing success. For example, over the past year the organization has expanded its coverage of services available to seniors, including guidance on managing the use of new technology in their lives, and helpful tips for staying healthy, fashion-forward, and financially secure as they reach new and unfamiliar phases of their lives. 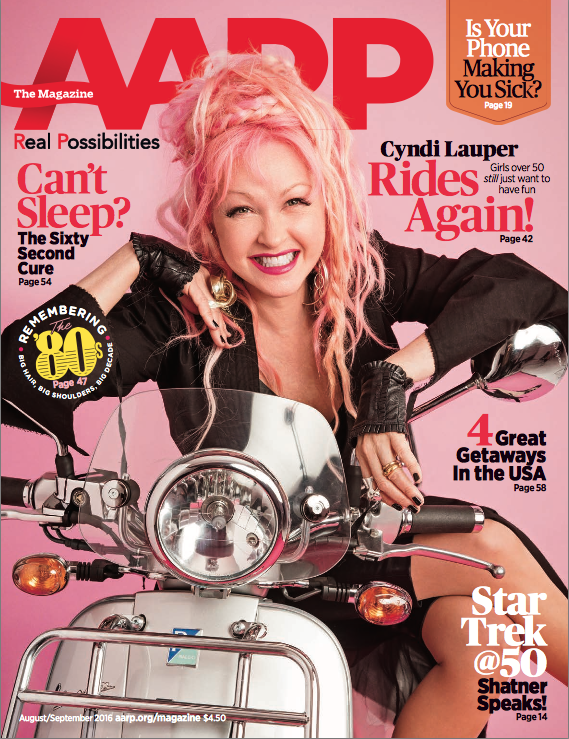 With a total readership of over 37 million, and research that shows 54% of its members read three or four of the last four issues, AARP doesn’t have to solely rely on hard data to evaluate its success and determine its editorial direction; it listens to the strong voice of its ever-expanding community of fans and followers who have shared their glowing praise in countless emails, letters, and social posts. And while the boomer generation may no longer be the largest demographic in the United States, the over-50 set still exercises tremendous persuasive power – both socially and in their demand for content that directly addresses their unique situations and informational needs. That AARP consistently demonstrates its commitment to meeting its audience’s evolving needs in a compelling, entertaining, and useful way is a testament to its overall brand value. Early on, tech solutions provider CDW recognized the power in using thought leadership content to build the trusting relationships that are critical to driving its business. But while the goals for its successful Tech magazine program have remained largely the same since its inception in 2002, the company has shown little interest in resting on its laurels. Instead, it has committed to evolving the ways it uses content to strengthen its position as a trustworthy and technically astute partner in the tech decision-making process. Rather than retaining editorial processes that might have sacrificed growth potential for reasons of team convenience or comfortable familiarity, the company instituted a content-first, channel-neutral approach, ensuring that quality would be the focus of every content project – regardless of where or when the content would be distributed. 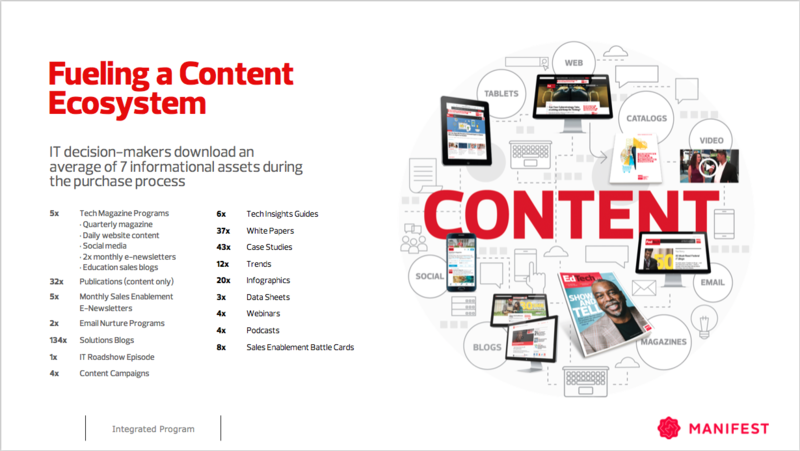 For example, CDW shifted its brand newsroom processes so it could publish new content daily for each of the websites in its portfolio, while also posting print magazine-assigned content as soon as it became available (rather than waiting for its quarterly print issues to mail). These efforts to provide more immediacy resulted in more consistent traffic across each site rather than spikes around print mail dates. Then, to achieve greater editorial efficiency and streamline distribution, the company replaced its practice of assigning e-newsletter-exclusive content for a daily web feed to using a compilation of “best of the web” content for inclusion in a bimonthly newsletter. By exploring newer best practices and processes, and by making ongoing improvements as new audience insights come to light, CDW has been able to build a robust, responsive content engine well equipped to serve its customers’ informational needs today, and continue to drive its content and revenue goals forward, even in an industry as dynamic as technology. 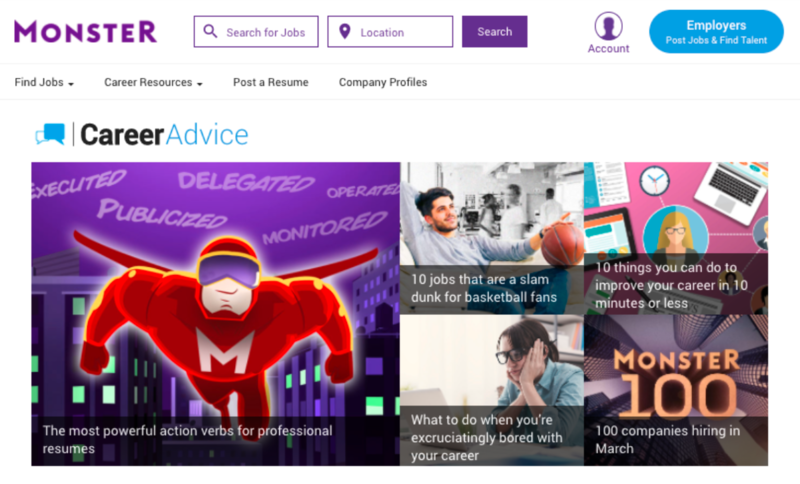 Another advice-driven example of content marketing excellence comes from Monster, which redesigned its Monster’s Career Advice section in 2016 to better help today’s job seekers advance their careers and increase their job satisfaction. But what truly stands out about Career Advice isn’t just its employment news, industry analysis, resume templates, and other proprietary content tools that give its audience a leg up in the highly competitive job market – it’s the company’s overall content mission of bringing humanity to a process increasingly driven by technologies like resume scanning software, search bots, and automated referral services. In keeping with this mission, one of Monster’s primary goals for Career Advice was to drive membership on the site so job seekers could empower themselves to become better candidates for the positions listed on Monster’s job boards (or anywhere else). Monster’s content team pursued these goals through the 15 blog posts each week. That’s in addition to the company’s other content franchises, such as its monthly Monster 100 list of top companies hiring, a newly launched video program, and a new monthly podcast – Jobsessed. Subject matter expert Vicki Salemi was on hand to lend her industry authority to the site, as well as to contribute her own original content. Over one-fifth of traffic to Monster – 22% of unique visitors – entered through content in 2016. Monster’s expanded content program saw a total of 96 million page views last year, up 18% from 2015. In its first year, Monster’s video program earned 537,000 video views, with only 30% coming from paid ads. Four million job searches were initiated from visits that began on content pages – an 18% increase year over year. The Monster 100 list achieved a stunning 65% conversion ratio from page view to job search. A soft-close member capture gate launched on all content pages in September 2016 resulted in 48,000 new members (an achievement the company estimates would have cost $3 million-plus to acquire through online advertising). As I recently pointed out, using content to educate readers or offer advice on topics that they care about can help establish conversation points and build trust – which, in turn, can drive increased interest in your products and services. It takes guts (and sometimes lots of convincing for executive naysayers) to stray from writing about the products and services you know best; but when it’s done right, the payoff can be big. Consider this campaign from HBF, Western Australia’s oldest and largest private health insurer. Last year, it developed its first content brand, Direct Advice 4 Dads (DAD). Taking a page out of the Content Inc. playbook, the company steered clear of the crowded maternity market, and identified a gap in pregnancy and parenting content targeted to new and expecting dads (who, by the way, are just as involved as moms in making decisions about their family’s health insurance needs). HBF’s decision to tilt its content focus to serve this untapped audience turned out to be a key factor in DAD’s success – and a source of inspiration in the lives of the dads who now engage with it regularly. Using a blogging and social media strategy, the brand generated 171,000 unique visitors and 21,000 followers on Facebook in its first five months and continues to grow, gain media attention, and bring new dads into the conversation. Not surprisingly, the DAD platform is becoming a powerful referral path for HBF. It’s never too early to think about the Content Marketing Awards in 2018. Sign up for CMI’s daily or weekly newsletter for advance notice when the call for entries opens early next year. As General Manager of CMI, Stephanie leads the brand’s event, digital, print, and e-learning operations. 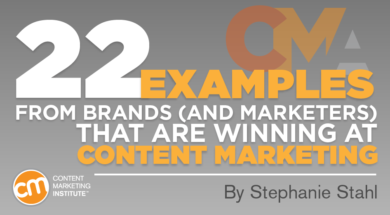 Previously, Stephanie served as VP of Content Marketing for UBM’s Technology portfolio, providing strategic guidance on content development, content optimization, audience engagement, and go-to-market platforms for technology clients. Stephanie also spent many years as Editor in Chief of InformationWeek. Find Stephanie on Twitter @editorstahl and LinkedIn.